Civics is all around us. Being informed about civics takes work. There is a lot to know about the government and how “We the People” interact with the government and each other. 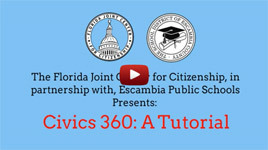 Use the resources in the modules to enhance your civic knowledge and skills. Click on a Topic Area below to get started. Questions about the resources on this site and how you can use them may be directed to Dr. Stephen Masyada at stephen.masyada@ucf.edu.